With the top seed for the Eastern Conference potentially hanging in the balance, two teams few thought would be leading the race squared off in Air Canada Center of Toronto. The Toronto Raptors, fueled by a sudden switch to a more modern style of play and arguably the league's deepest bench met an injury-riddled but somehow still over-achieving Boston Celtics team in a battle that might well end up deciding Coach of the Year for Dwayne Casey and Brad Stevens as well. The environment was oddly quiet from the opening tip, with nary a hint of playoff games still almost two weeks into the future. Boston got off to a rough start early, losing the tip and missing multiple attempts to get on the board first, only to see Jonas Valanciunas put the Raps on top. Both teams had difficulty getting buckets at first, with several misses and blocks keeping the score low until about the eight-minute mark. Neither team could get any separation until the waning seconds of the quarter - Toronto's lowest scoring of the season - which ended with the Celtics up 20-14. The second frame began with Toronto erasing most of that lead in the first two minutes, and the score stayed close and low until the Raps pulled ahead by six at the 5:30 mark. Toronto would find their rhythm as the half wound down, going on a 20-3 run to push the lead to 14 with a minute and a half left in the half. Boston would cut the lead to ten to close the half out at 33-43. The second half started with more tough-to-watch ball, with Toronto striking first at just under eleven minutes to go in the third, quickly pushing the lead back up to 14.Boston battled back to 37-47 with eight left in the quarter. DeMar De Rozan began to heat up late in the third, pushing the lead back to 14, but Al Horford and Semi Ojeleye helped stopped the bleeding with trips to the charity stripe. A bucket by Jakob Poeltl and a trey from Kyle Lowry gave the Raps their biggest lead of the night at 45-60 with 3:30 left in the third. Toronto kept their foot on the gas, pushing the lead to twenty with 1:30 left in the half, but Marcus Morris and Greg Monroe cut it back down to 14 to close the frame. The final quarter saw Moose head to the line to cut the lead to 55-67, and he and Morris continued chipping away at the lead. A Fred Van Vleet trey looked like it wrapped Boston's chances to come back until Horford answered back with one of his own at the eight-minute mark. 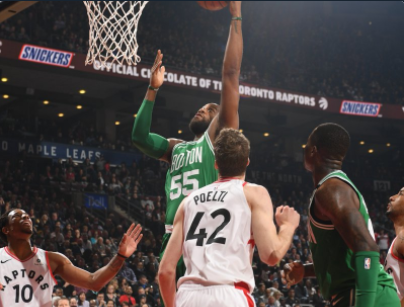 Every time the Raps seemed ready to put the Cs away with a Van Vleet make or a Serge Ibaka dunk, Boston answered back, but sloppy play and a massive lead proved too much to overcome, with the Raptors taking the match and likely the first seed 96-78. The Celtics next face the Chicago Bulls at home on Friday, April 6th at 7:30 pm EST.